ola riders! Estamos começando os reviews do mais novo set especial chamado Cybernetic Horizon ! estamos analisando nessa semana as cartas de suporte pro arquétipo Gouki !!! LETS GO! é um arquetipo de earth atribute warrior type monstros usados pelo personagem GO ONIZUKA do novo anime YUGIOG VRAINS. Todos possuem efeito de recuperaçao do cemiterio. Nao tem suporte pra sincronizaçao, fusao ou ritual. tambem naum da pra fazer xyz porque os levels sao desiguais. Porem tem link monstros proprios; isso faz deles o primeiro arquetipo dedicado a link mechanics. You can only use this card name’s (1) and (2) effects once per turn each. (1) You can reveal this card from your hand, then target 1 “Gouki” monster you control, except “Gouki Moonsault”; Special Summon this card from your hand, and if you do, return that target to the hand. (2) You can target 1 “Gouki” Link Monster in your GY; return it to the Extra Deck, then, you can add 1 “Gouki” monster from your GY to the hand. comentários: auto-summon mas com custo. também tem efeito de reciclagem de link monstros imbricado com recuperação de monstros do cemitério. INTERESSANTE! (1) If this card is sent to the GY as a Link Material for a “Gouki” Link Monster: You can activate this effect; that monster gains 1000 ATK until the end of this turn. (2) During your Main Phase, except during the turn this card was sent to the GY: You can banish this card from your GY, then target 1 “Gouki” Spell in your GY; shuffle it into the Deck. (1) If you control no monsters: You can reveal this card from your hand, then target 1 “Gouki” Link Monster in your GY; Special Summon this card from your hand, then, Special Summon that target, and if you do, that monster loses 500 ATK. (2) If you control a “Gouki” Link Monster, this card cannot be destroyed by battle. comentários: melhor carta do set! além de se auto-invocar, ela ainda invoca um gouki link monstro do cemitério. além disso tem efeito de invulnerabilidade (totalmente desnecessário). (1) Once per turn, when a monster this card points to activates its effect (Quick Effect): You can negate that activation, and if you do, destroy it, then, you can Special Summon 1 “Gouki” monster from your GY, except “Gouki Shadow Ogre”. Materials: 3 or more “Gouki” monsters. (1) This card on the field cannot be destroyed by battle, and is unaffected by the activated effects of monsters your opponent controls that have ATK equal to or less than this card’s ATK. (2) When this card on the field or a monster this card points to is targeted by an opponent’s effect at activation: You can have this card lose 500 ATK, and if you do, negate that activation. comentários: link 4 boss gouki! Possui imunidade contra batalha e efeito. possui efeito de negação ; e finalmente possui efeito de boost. NADA MAL! voltamos em breve com mais Cybernetic Horizon pra vcs! 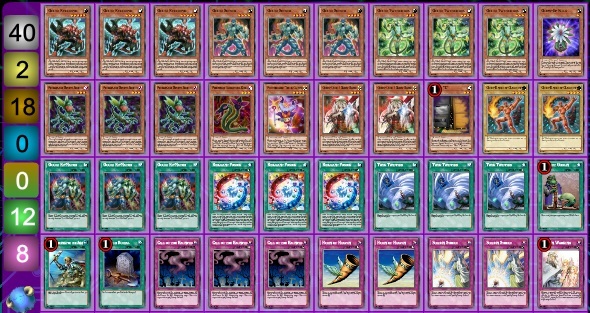 Troymare Gouki 1 card Insane Board! Searchable Fossil Dyna & Domain Lock - Brilliant Gouki BROKEN?? Recoded Alive Has INSANE Potential! Gouki Headbutt Bat Gives Gokuis Extended Plays!